As I had to go for a one day meeting in Singapore yesterday, my office had booked me ticket for the 2nd earliest flight with Batik Air which lucky for me had an inflight entertainment. I browsed through the limited options available due to the short duration of the flight and could only found 1 movie interesting in the Chinese movies section as the rest were either watched or pretty low standard. So I chose this one which ran almost 2 hours and I was able to finish the movie during my departure flight due to its delay for almost 1/2 hour. Anyway, here is a more complete view of the movie. This movie was telling the story of a fire fighters unit in one of Hong Kong's district led by Yip Chi-Fai (Andy On - New Police Story, Blackhat etc) who was going to be promoted to a new position in the head office. His successor was a humble & calm officer named Sam (Nicholas Tse - From Vegas to Macau, Beast Stalker, Dragon Tiger Gate etc). There was also a very veteran officer named Lee (Simon Yam - Sa Po Lang, Lara Croft: Tomb Raider and many more) who was giving physical training to new recruits. And another senior officer named Yau (Shawn Yue - Infernal Affairs trilogy, Dragon Tiger Gate etc) who was very supportive of Sam. The unit just received few new recruits with two notable ones named Ocean (Hu Jun - Red Cliff, Body Guard and Assassin etc) a veteran from mainland China and Cheung Man-kin (William Chan). On the eve of Christmas day of 2013 where it was one of the hottest day in Hong Kong, there was a fire in a factory where Sam and his unit did well to put out. Sam saw that the factory location was nearby a gas pipe which need to be cooled off and was thinking of spraying water, but Yip who came to the location decided it was not really necessary. This was due to the fact that it was Yip's last day in the unit and he wanted no trouble on that day, especially with his boss visiting over later. Meanwhile, in a gas power plant, the head of the plant named Mr. Man (Patrick Tam - Ip Man 3) was given a lot of pressure by his bosses who demanded not to have any blackout during the Christmas Eve. A senior member of his team named Yang Lin (Michelle Bai) was warning him about the pressure of the gas pipeline that was already very high and needed some major maintenance, but he disregarded it. As you would have guessed, there was indeed some troubles caused by the rapture of the old gas pipe near the factory which was endangered due to the fire on that factory. A huge catastrophe had to be stopped by Sam's team. Things also became very much complicated with some people trapped in the power plant including Yau's son. So could the fire be stopped? Could all the people be saved? Find them all in this interesting rather emotional drama thriller movie. I gotta say I was pretty impressed with this movie. I thought that it was going to be a movie with bad special effects (due to a rather amusing video of fire fighting promotion in the earlier part), but it turned out to be a good one. As I checked more details about this movie in the internet, apparently it garnered some nominations in the 2014 Hong Kong movies awards with one of them the visual effects. It even won the best action choreography category. Yes, this is a 2014 movie so it was not a very new movie, but I only got the chance to see it now, and I am glad that I decided to watch this one. I guess I should try and see it in a better quality and bigger screen to have it more enjoyable especially to look at the visual effects which I believed were quite stunning. 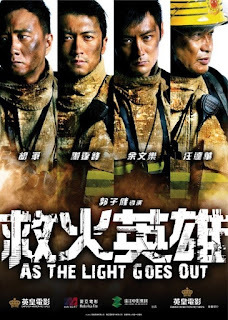 As a movie about fire fighters, the emphasis of this one was a little bit on the way they save the people in the trapped location and therefore it is not a complete drama but I think can be considered as semi-disaster movie in a small proportion. It is focusing on how the fire fighters used all possible equipments they can use combined with every experience they had to save the people from the collapsing of building structure and not to mention the danger of a gas power plant with dangerous substance as well. There were of course some dramatic moments during this attempt of saving, and I totally loved the scene that the director did before the ending that involved Nicholas Tse's character. I think it was wonderfully done. I am sure that it was a moment that would make lots of audience emotional (I can already imagine my wife full of tears then and possibly in some more scenes before that). Since the movie was more focusing on the saving people, there were not that many scenes showing the on-screen chemistry of the main characters. Only few scenes involving Lee and Ocean or Yau with his son, but the rest seemed a bit too little. Though to be fair, if we have more such screentime, the sequences for saving the people might be lesser, or the movie would be too long. This one already had almost 2 hours duration. Anyway, for you who are looking for a action drama of fire fighters saving people, then this movie would be a very good option. Recommended to see this on large TV screen with good sound system to have a better visual effects and sound impact. If I am not mistaken, the movie is sometimes shown in Hong Kong cable TV channels so if it is showing at your convenient time, you can have a try to see this one. Oh 1 thing to take note is that it is not a thriller firefighter movie like Hollywood's Backdraft, so there is no need to compare that and this as it is a different genre though both telling story of firefighters.